The fighting which took place at Mount St Bridge is an example of how unprepared the British troops were in engaging in full-scale urban warfare. At approximately noon on Wednesday two battalions of the Sherwood Foresters marched towards Trinity College by way of Mount St Bridge. Many of the soldiers were young men, new recruits who had never fired a rifle, and the ensuing attack from rebel forces resulted in a high number of British casualties. A key position for the rebels was Clanwilliam House, a large Victorian residence situated on the city side of the bridge, in which it was easy to fire upon British soldiers who had no cover. 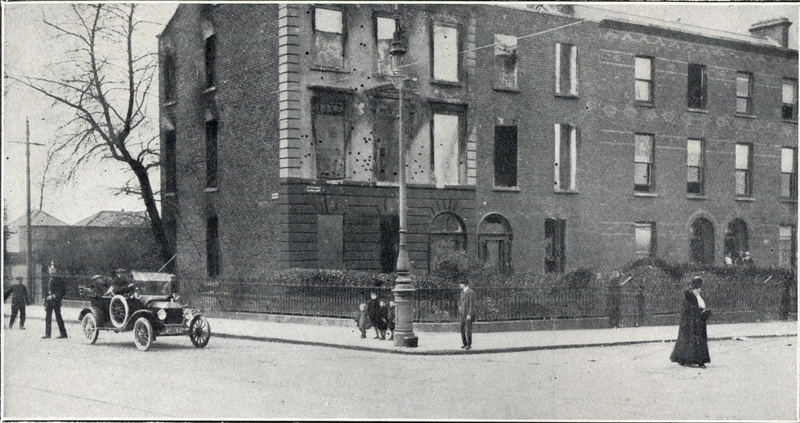 With reinforcements being sent in, General Lowe ordered a full-frontal assault on Mount St.
As with other locations, by virtue of sheer troop numbers and their superior firepower, the British forces eventually secured Mount St Bridge and their route into Dublin city centre. But with over 200 British soldiers killed or injured, it had been a bad day for the British Army, and it was clear that General Lowe’s order to engage in a direct assault had been a tactically flawed decision.